The Nibelungenlied, translated as The Song of the Nibelungs, is an epic poem in Middle High German. It tells the story of dragon-slayer Siegfried at the court of the Burgundians, and of the revenge of his wife Kriemhild, which leads to the death all the heroes of the Bugundians and of Kriemhild as well. 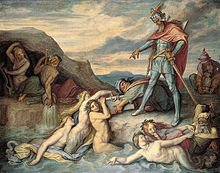 The saga of Siegfried was also used in the opera cycle Der Ring des Nibelungen of Richard Wagner. Nibelung in this context means "dwarf". The Nibelungenlied is based on earlier works. It was part of oral tradition, meaning it usually was not written down. During the Middle Ages people started to write down stories more and more. Overall there are about 35 German sources and one Dutch source for the story. There was an original manuscript but it has been lost. The three oldest manuscripts have been labelled A, B, and C.
B seems to be closest to the original; however, the real relation between the three manuscripts is unknown. The Nibelungenlied probably had a broad oral tradition, as there were many different versions. It is difficult to judge how these oral versions influenced the written ones. 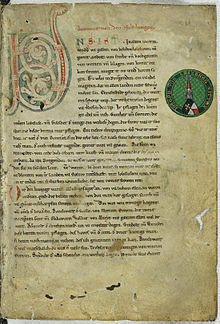 Manuscripts A and B end with daz ist der Nibelunge not (that is the fall of the Nibelungs); for this reasons, they are known as the Not versions. Manuscript C ends with daz ist der Nibelunge liet (English: that is the song/epic of the Nibelungs). It is known as the Lied-version. In total, the C text has been edited with regard to the public of the time. It is less dramatic. This probably made it more popular. Aesthetically, the B text would have been the greatest artistic achievement for a contemporary public. Der von Kürenberg - He wrote very similar poems, and one poem the Falkenlied (falcons' song) is reflected in a dream by Kriemhild. Most researchers however believe that he lived before the Nibelungenlied was written down. Walther von der Vogelweide - He has a very similar vocabulary (this can also be expalined by the fact that he lived in the same area though). His fundamental views were very different from those expressed in the Nibelungenlied though. Konrad von Fußesbrunnen- He wrote a 3.000 line poem The Childhood of Jesus, and was active around Passau. His style is totally different from that of the Nibelungenlied. An unknown nun of the monastery in Passau; The monastery of Passau, the city and its merchants are mentioned in the song. This is probably because they financed part of it, not because the author was from there. Serious researchers tend to ignore the last three options, because there is not enough evidence to support them. of the fighting of bold warriors, now ye may hear wonders told. Kriemhild geheizen. Si wart ein schoene wîp. Through whom high thanes a many / to lose their lives soon doomed were. Wikimedia Commons has media related to Nibelungenlied. This page was last changed on 1 December 2018, at 11:22.